Protection! Enterprise is a complete turnkey solution designed to bring real value to software publishers by providing full automation of licensing processes together with management of licenses, customers, and evaluators. Protection! Enterprise is orchestrated to seamlessly work together with all other Protection! Licensing Toolkit products in one feature-rich and coherent environment. Protection! Enterprise oversees and manages licenses, license actions and customers. Software publisher or vendor is able to track evaluation licenses requested by users, manage commercial licenses issued to customers, manage licenses activation and deactivation. A complete back-office solution designed to host an unlimited number of products; to generate, activate, deactivate and to deploy an unlimited number of licenses for each of the hosted product. Enterprise Server provides full support for working with license requests based on Serial Numbers; preventing multiple evaluation requests; providing software publishers with multiple license delivery mechanisms including rich macro language support for creating and customizing e-mail templates. Enterprise Server's license activation support automatically manages all available license activation providing software publisher with the peace of mind that no activation based license would be circumvented. A rich GUI application for managing all aspects of the license processes, customers and their licenses. Enterprise Manager provides complete end-to-end management environment covering configuration of Protection! Enterprise Server users and their permission; setting up products and their accounts and permitted licensing activities; design custom e-mail templates with rich macro language support; navigating and drill-down to complete license's and customer's detail and associated license action for each and every license. Enterprise Manager's reporting, customizable views, filters and powerful exporting capabilities makes it a complete licenses and customers management solution for the software publishers. Protection! Connect Server - J2EE application that listens to the Protection! Enterprise events and forwards them to all registered Protection! Connectors. Protection! Connector(s) - J2EE application(s) responsible for handling Protection! Connect events and for adding/updating data in CRM application (i.e., adding contacts or creating opportunities). Rapid Deployment, Affordability and Easy Administration. No need to develop custom backend implementation. Low TCO and exceptional ROI. Complete business logic for licenses generation, deployment, activation and deactivation. Complete licensing activities analysis and reports. Rich export and import functionalities for integration with the third-party systems. Subscription model provides product updates, maintenance and support. Ability to host an unlimited number of products. Ability to generate, activate, deactivate and distribute an unlimited number of licenses for each hosted product. Logging all of the licensing activities. Licenses activation support with controlling over the available activations. Ability to define number of available activations. Trial licenses support with automatic ability to restrict customers from getting trial licenses more than once. Serial Numbers support with automatic tracking of already issued. Support for Online and Email licenses delivery. Customizable E-mail message templates with extensive Macro support. Support for Oracle Database and MySQL Server Databases. Authentication and authorization per Enterprise Server with ability to maintain Enterprise Server users. Connect to multiple Enterprise Servers. Managing accounts and permissions for all types of licensing activities (license delivery type, license actions and license types). 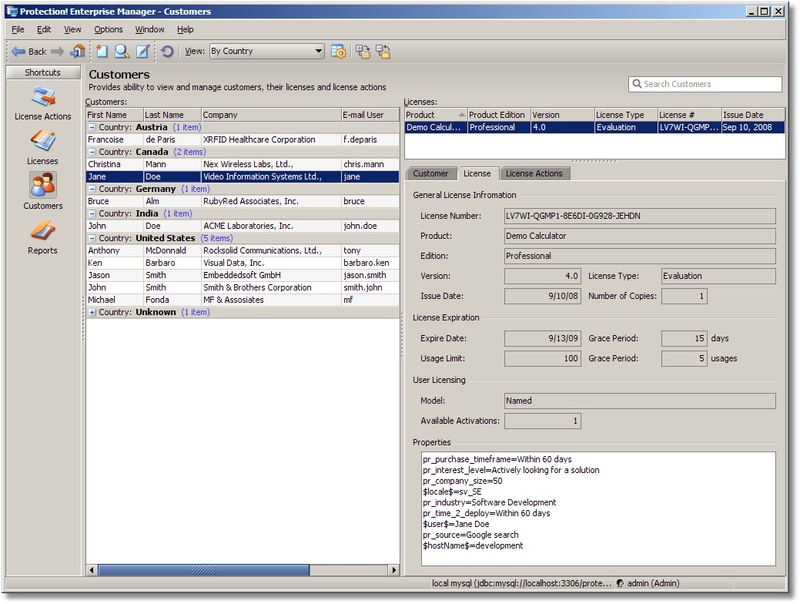 Viewing customer information for each individual license. Viewing license actions for each individual license. Viewing reports on all licensing activities. Rich presentation grid with ability for high level of customization: ability to create custom grouped views with filters and custom sort order; manage visible fields (columns) and their order; etc. Import of license actions from license delivery log file of the Protection! Sales application.